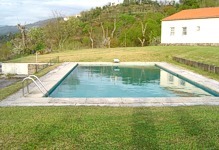 This fantastic villa is located on a large biological farm close to Amarante and the River Douro Valley. Beautifully furnished and with a well-maintained private garden and swimming pool, this is a lovely villa and the perfect base to explore the stunning surrounding area. Quinta do Ladario has everything you will need for a great stay. The villa’s spacious and well-furnished living room is divided with a sofas and chairs surrounding the fire on one side, and a games area on the other (with a pool and games tables). Its large kitchen is fully equipped and there is an adjacent laundry room. The villa’s three bedrooms (two double rooms and one twin) are extremely comfortable and two have ensuite bathrooms. This villa also has an exercise bike and rowing machine. This villa provides a truly tranquil environment, perfect for taking in the magnificent views over valleys and the River Ovelha. The villa itself is surrounded by a large expanse of lawn, and a swimming pool. There is also a barbecue area, ideal for enjoying the long summer evenings. This villa is perfectly located to explore the Douro Valley and the beautiful towns along the Tamega valley. The town of Amarante, approx. 10 kms away, is extremely pretty with the Serra de Maroa mountain range as a backdrop and the Tamega river flowing through the town centre. This is a great area for outdoor activities. For golfers the nearest golf course is in Amarante. The famous city of Porto, famous for its Port Wine, is 55 kms way and is well worth a trip to visit the Port Wine lodges and maybe take a cruise up the stunning Douro valley. Closer to the villa, there is a minimarket 300m and the nearest restaurant is 1 km away. This has been an excellent place to stay. We have all enjoyed the spaciousness and comfort. We've had a great time playing in the pool and reading in the garden. Thank you for your warm welcome! Comment posted by J. F.
Fantastic experience. The owners were incredibly generous with us. The property has 3.5 bathrooms, not just 1, and the swimming pool was in excellent condition: a must for the 30+ degree days we had in August. The house is spectacular, clean, and the rooms are all large and spacious and tastefully arranged. The beds very comfortable. The kitchen immense and fully equipped. We will book this place again.